This drawing shows very well the inside of the exhaust system. From left to right, it starts with the Exhaust Cover. Inside the cover you will find the three Piggies that are welded to the Exhaust Canister. Inside the Canister are the Rear Baffles (3) that consist of three pipes each one with a mini Glass Pack (silencers). At the end of each Baffle there are the Baffles Plates. If you insert a stick through a Piggy pipe it will stop when touch that Plate. After the plate there is an empty compartment and after, the Front Baffle system starts. This is very similar to the Rear Baffle system and each pipe has a Plate at the end. After the Front Baffles there is another empty space and then you will reach the end of the Canister, where the Header Pipes are welded. This process will not require any carburetor modifications nor re-jetting. It is very important to understand that this is a process that will modify the original exhaust system so you will need to check how this may affect the warranty of the bike. Several people reported that there is no problem with the bike warranty, just with the exhaust warranty but please check with your local dealer. This is a safe and inexpensive process to improve the sound pitch and level and avoid purchasing expensive pipes that will change colors after some time, giving an uneven look to the pretty chrom look of the Valk. This drawing show the Exhaust Cover. There are three 8mm bolts that holds it, one is connected to the lower Piggy and the other two are connected to the Canister. Release the three bolts to expose the Piggies. 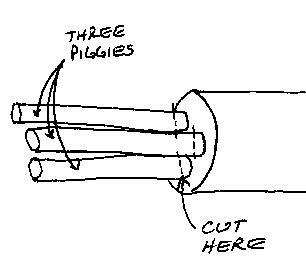 You need to cut the Piggies as close to the canister as possible using a hack saw or whatever you have at hand. The science here is just cut them. You may do the three but remember that this will cause that the one that has the bracket where the Cover bolt is attached will be loosed. The remaining two bolts are more than enough to hold the cover in place with no problem at all, so go ahead and cut all Piggies. Now replace the Cover and fire the baby. Listen to the sound while running the bike. The sound will be a bit fuller and deeper, since it will resonate inside the Covers. I want to make clear that will NOT sound louder, just the pitch will be noticed. I used a decibel meter and didn't register a noticeaable increase. If you still want more sound, go to the next step. This picture show the Piggies already cut almost flushed to the Canister. Inside the Canister are the Baffles attached to a metal piece that hold them. If you use a long dowel or long screw driver and insert it through one of the holes, it will stop when reached the end of the baffle. There is a piece of metal at that end that will be refered as Baffle Plates. Using a long (at least 12" long) drill bit, drill the Baffle Plates. Please use a new bit and don't push too hard. Make is softly since we don't want too many residues to drop inside the Canister. The major sound level impact will be experienced when drilling the first one on each side. The sound will be louder but not obnoxious. It will sound throatier and deeper. Go step by step remembering to drill both exhaust at the same time. Once the six (three on each side) Baffle Plates are drilled and you still want more sound, then go to the next step. 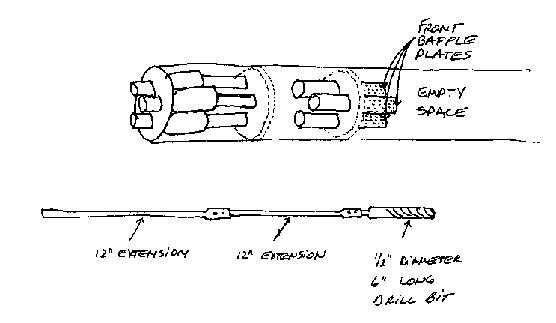 After some research, it is recommended to proceed with the next step in the other page, the "Ragnar Cut", before this drilling the front baffles. There will be more sound level impact by performing the "Ragnar Cut" and there will be no shimming nor re-jetting required. Also, after taking out the rear bafflex completely, will be a lot easire to drill the front baffles if you still decide to go ahead with this modification. This involves drilling the Front Baffle Plates. To do it, you will need a very long drill bit, at least 20" long. Since it is very hard to find, I'll show you my idea. It consist of attaching together two drill bit 12" extensions that are very easy to find on any hardware store. Please be sure that the connection is very strong since we don't want any piece to drop inside the Canister. Once both pieces are tight together, insert a 6" long 1/2" diameter drill bit at the end. With this new hardware, insert it through the Rear Baffle holes until reaching the Front Baffle Plates. Follow the previous procedure very careful and step by step. You will experience a little louder, deeper and throatier sound. You will agree with me that there is no BIG difference but many people stops here. I did not.